The Northern Territory has officially been declared banana freckle free, with the proof of freedom handed down today. The news is a significant achievement for all involved in the eradication, including Australia’s commercial banana growers, the Northern Territory public and Government agencies. Banana growers across the country funded half of the cost of the National Banana Freckle Eradication Response Program through a levy, and also contributed technical expertise and knowledge. You can read ABGC’s media release here. Using tissue cultured plantlets will go a long way to ensuring your farm is pest and disease free – and prevent further spread. There are many laws that govern the use of planting material and biosecurity obligations – restrictions on what you can take across state and quarantine borders, as well as biosecurity or quarantine zones within each state and territory. These borders and zones exist to limit the spread of pests that are localised to that area. Please be aware of the very real risks if you are thinking of using bits and suckers. More information about these laws can now be found on the ABGC website. Time for Sarah to (banana) split! After four fantastic years, ABGC’s Reef Team Leader Sarah Simpson is leaving South Johnstone to pursue the next chapter in her career. Sarah’s dedication to the industry, hard work in the Reef space and all round a-peeling nature will be sorely missed by all. The ABGC team, on behalf of all the growers and industry reps Sarah has worked with, wish her all the very best for her next adventure. If you are keen to drive change, deliver water quality outcomes and support growers within this vibrant industry, there could be a job here for you! You’ll lead and report on all aspects of ABGC’s new BMP project, including managing the day-to-day operation of the Reef Extension team. View the full advertisement here. Applications close February 4. You’ll be responsible for technical support of the Banana Nutrient Rate Trials project, which aims to provide improved horticultural agronomy for reef water quality in banana production systems of the Wet Tropics. More information here. Application close February 13. 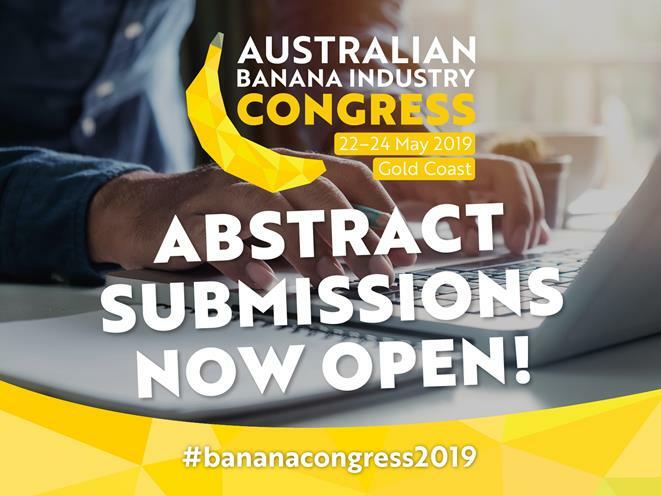 If you work in the world of banana science, the Australian Banana Industry Congress is the perfect chance to present your research to those who will put it into practice. There are two key ways to deliver your message: three-minute speed talks or display posters targeted to the audience of growers and industry stakeholders. For more information about this exciting opportunity, visit the Congress 2019 website. Got old chemicals stored on your Queensland or New South Wales farm? ChemClear has scheduled collections in coming months, providing the perfect chance to clear out appropriate waste. ChemClear is a widely recognised program that manages the risks associated with obsolete agvet chemicals. It’s designed to be safe and convenient. For information on eligible chemicals, to register or to make a booking in another state or Territory, visit www.chemclear.org.au. Biosecurity Queensland encourages all growers to help protect the industry from Panama TR4 in flood situations. Please limit the spread of mud and plant material on roads and verges and avoid sightseeing near flooded banana farms. Growers, service providers and the general community should avoid entering flooded farms unless it’s an emergency and reschedule your visit if you can. Before you visit, dial ahead and contact the property owner and follow their on-farm biosecurity procedures. Don’t just drop in. Come clean, leave clean by making sure vehicles are free from mud and plant material on farm entry and exit. Got a banana idea that could make a positive impact on Australian communities? Applications are now open for Churchill Fellowships, a program that allows recipients to travel the world and learn from the best to develop their chosen idea or project. There’s no limit on the scope of topics. The Churchill Fellowship Trust is currently running information sessions around the country, including in Cairns, Darwin and Ballina. For more details, visit their website.